I’ve mentioned before how much of a podcast addict I am. I have a huge list of them that I listen to regularly. One of my new favorites is called Surprisingly Awesome featuring Adam Davidson and Adam McCay. As you might guess by the name, each episode they try to convince each other that something that is apparently boring is actually, surprisingly, awesome. Some people are genetically disposed to taste broccoli as very bitter. Broccoli is in the plant species Brassica Oleracea which also includes cabbage, kale, cauliflower, Brussels sprouts, and kohlrabi. That’s right. Those are all the same species! Kohlrabi is apparently very delicious and won the in-episode taste test. Maybe because it looks weird or because it has a weird name, but kohlrabi is not a very common vegetable in U.S. grocery stores. Umm… that needs to change! I maybe had it once or twice before I listened to this episode but I immediately added it to my grocery list for the next week. It’s a delicious vegetable. Even broccoli haters will love kohlrabi. It’s sweet, crunchy, and almost almost tastes like an apple! 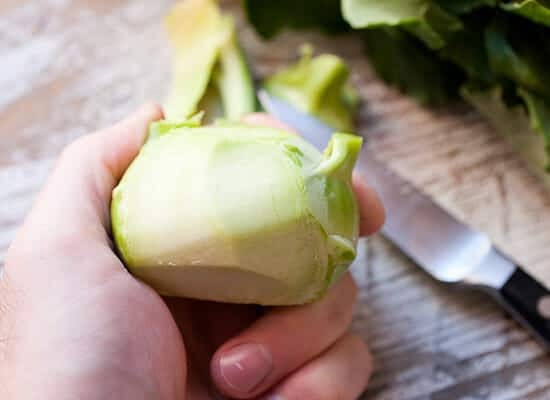 In an effort to try to convince you to give it a shot, here’s how to prep the strange vegetable and also a few ideas for how to eat kohlrabi! The skin of this stem is annoyingly tough to peel. A vegetable peeler won’t really do the trick. Instead, just take a paring knife and carve off the outer skin of the stem, revealing the lighter interior. Peeling is the hardest part. Once peeled, you’ll be left with light green bulb. It’s such a delicious little thing that I’m not kidding when I say I could eat it like an apple. It’s crunchy and slightly sweet and doesn’t need much help to be delicious. Why is this vegetable not more popular?! For starters, I like kohlrabi best raw. So none of these recipes involve cooking it. That means they are really easy and perfect for getting started with the veggie. Pick one and dig in. 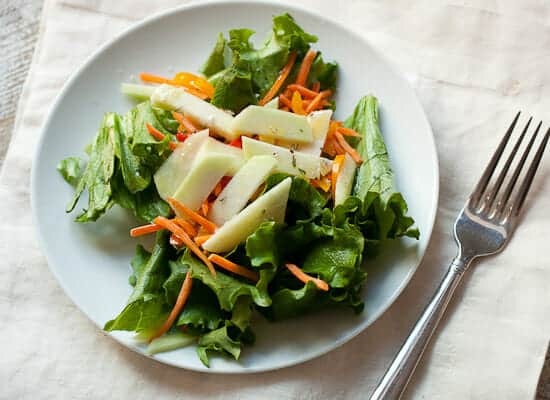 Kohlrabi is an easy addition to salad. Slice the peeled bulb into thin strips and toss it with a few other veggies and a light dressing. I thought it was particularly good with a little mint. If you leave the kohlrabi strips chunkier, they make great dippers. 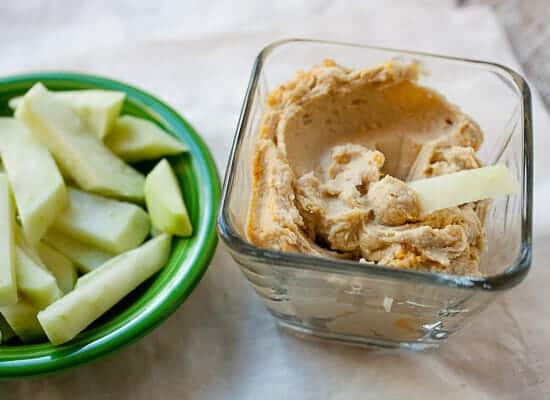 Add them to your next veggie platter and serve them with hummus, ranch dressing, or any other dip you would normally serve veggies with! This is a kind of fun one. Once you’ve peeled the kohlrabi, slice it into very thin chips. I actually used my mandolin for these, but you could just do your best with a knife also. Sprinkle the chips with a little salt and chili powder. Good snacking! 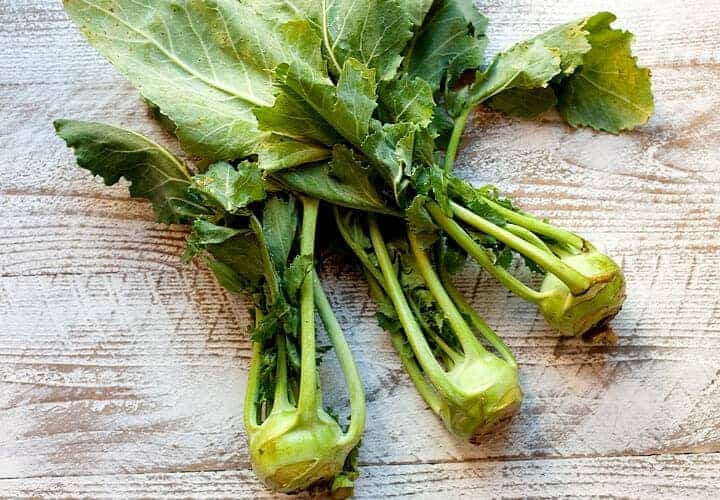 As far as the greens go on your kohlrabi, don’t toss them! Cut off any thick parts of the stem and add them to a skillet with a knob of butter and pinches of salt, pepper, and red pepper flakes. Cover the skillet and cook the greens over medium heat for 8-10 minutes until they wilt down. 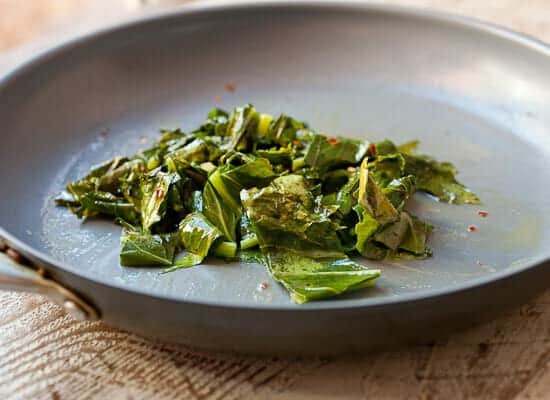 They end up being almost like braised collard greens but much sweeter. Any Kohlrabi lovers out there?! Leave a comment if you have any ideas on how to use it! Cube it, throw it in a foil pack with some chopped garlic, salt, pepper, good olive oil and grill it for 20-25 minutes. Soooooooooo delicious! Nice. Love that idea. Thanks John! I used to get these in my CSA all the time and had to come up with ways to use it before it went bad! We used to get purple ones, too. They are the weirdest looking things, but are definitely tasty! I like to shred it and use it like cabbage in coleslaw. Add some shredded carrot and slaw dressing – yum. Also, it’s great when made into fritters, sort of like a potato pancake, but with the shredded kohlrabi instead. Whoa… kohlrabi fritters?! Adding that to my list… Thanks Alaina! 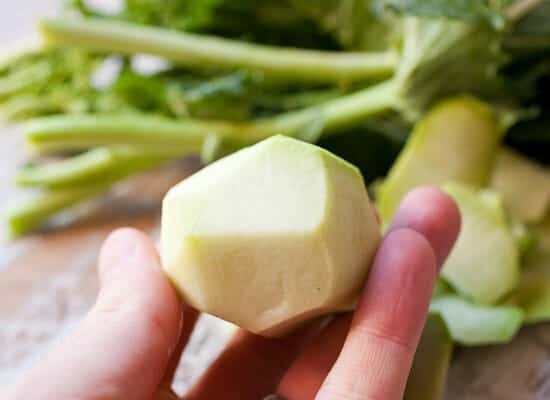 Kohlrabi is wonderful…and like you, my favorite way to eat it is raw! We grew kohlrabi in the garden when I was growing up, since my Czech mother couldn’t find it in the grocery stores where we lived in Canada. My parents grew Kohlrabi in a barrel in our garden in Minnesota when I was a kid. I remember liking it, and haven’t had it since. I have been seeing it at our grocery store in Henderson, NV. It is time to get back on the train! 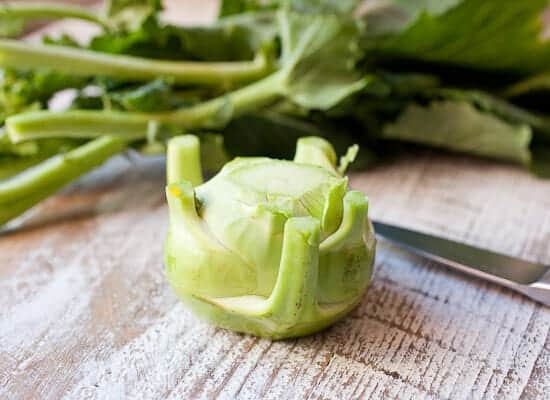 I grew up eating kohlrabi out of my grandma’s garden — one of my favorite childhood memories! She usually just served it raw, sliced & lightly salted. But I love to roast it with a little Parmesan sprinkled on top — just slice it & toss it in a little salt, pepper & olive oil before it goes in the oven. There’s a good section on kohlrabi in The Victory Garden Cookbook by Marian Morash (1982). You might be able to find it at your library. 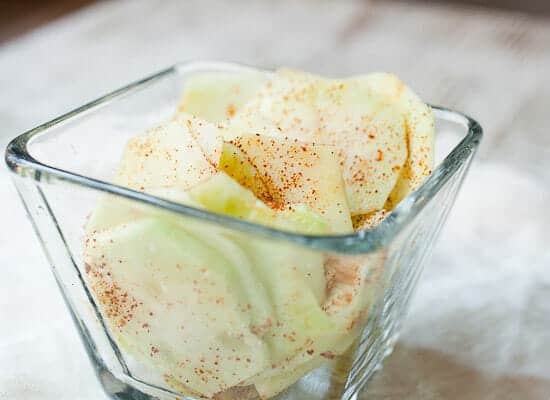 One recipe that sounds good to me is Kohlrabi Pickle Chips, a refrigerator bread-and-butter type pickle. Have made this several times with kohlrabi that comes in our CSA. Easy, keeps well and tastes delicious. It will go well with mayo or cream. Never knew about it until as a teenager my mother mentioned having it as a kid. Bought seeds and did a fine job of growing it in Phoenix. She seemed so happy to have something from her childhood that wasn’t available in the 1970s marketplace. We ate raw and cooked. Good stuff. My husband grows massive kohlrabi in our garden so we eat it a lot. They are excellent cut into “fries” and covered in a bit of olive oil and parmesean and roasted. They also make the base of a nice slaw when cut into small matchstick-sized pieces.